- and Precheur-Grand Riviere the historic mule trail connecting the Caribean and Atlantic coasts, perhaps the most suggestive of Martinique’s hikes. In general the paths can be done individually without any risk. 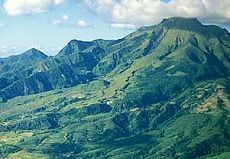 For several of the trails however, we recommend that visitors are accompanied by a mountain guide which can be easily contacted once in Martinique. There are numerous associations and professionals who will be willing to accompany you. When hiking in Martinique there are few rules, those that exist however are important: Always check the weather forecasts before organising a trek, especially when visiting the north of the island. Never cross a river in full flow or after rains. Always ensure you have plenty of drinking water as no matter how much you take it is never really enough. Even with suitable hiking footwear the terrain can often be slippery and difficult to grip. When trekking in the north it is essential to have some wet weather protection. Some parts of the island can receive up to 9metres of rain in a year! 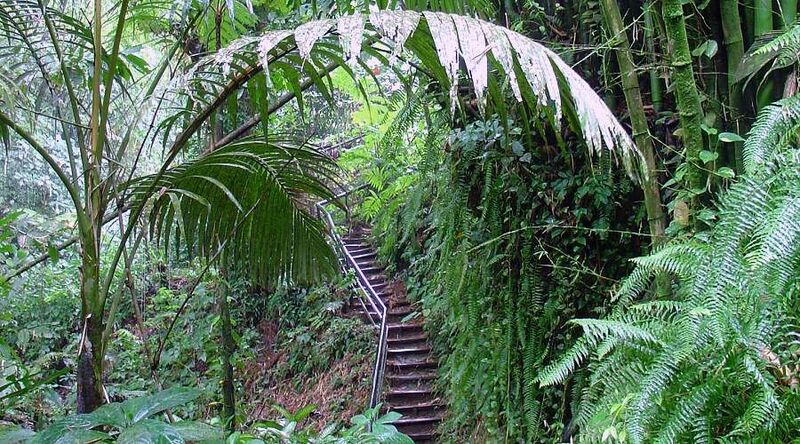 The old D10, which once connected the plantations dedicated to the cultivation of Cacao at Prêcheur and Grand' Rivière, is today a trail immersed in luxurious vegetation with valleys that still contain Cacao plantations, and bays with unspoilt beaches. It is possible to admire the Matoutou Falaise, renowned for its beauty. Once you have reached the end of the trail it is possible to retrun by the novel mode of traditional fishing yole. 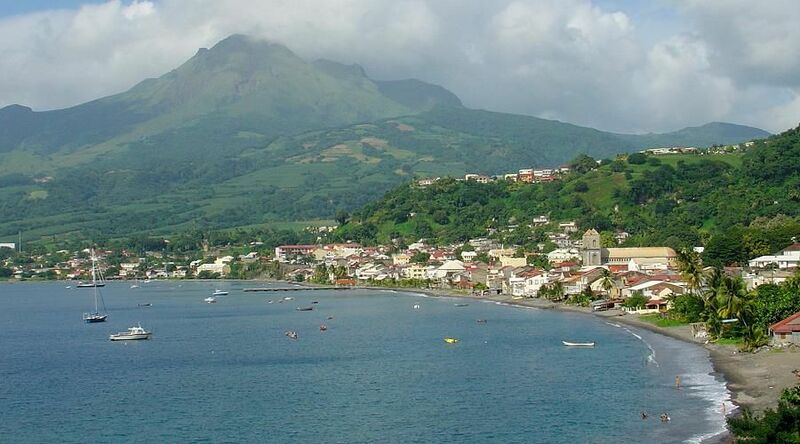 You should plan on approximately 6 hours to walk the 14 km of trail with beautiful panoramas of the islands’ coast, seas and the island of Dominica. You can organise your return voyage by fishing yole by calling the number 0596.557274, the cost is 11 euro per person. Different paths to reach Madame Pelee, with her 1395 metres and 30.000 dead in the eruption of 1902. Often shrouded in the clouds it is important to select your day to visit the sleeping beauty carefully in rder to fully appreciate the views afforded from her lofty shoulders. 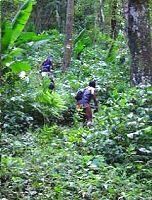 The easiest trail is the Aileron, departing from the first refuge, indicated along the road connecting Ajupa-Bouillon to Morne Rouge. Approximately 6 hours to ascend and descend the 882 metres and negotiate sections that could be considered quite technical in order to reach the peak. 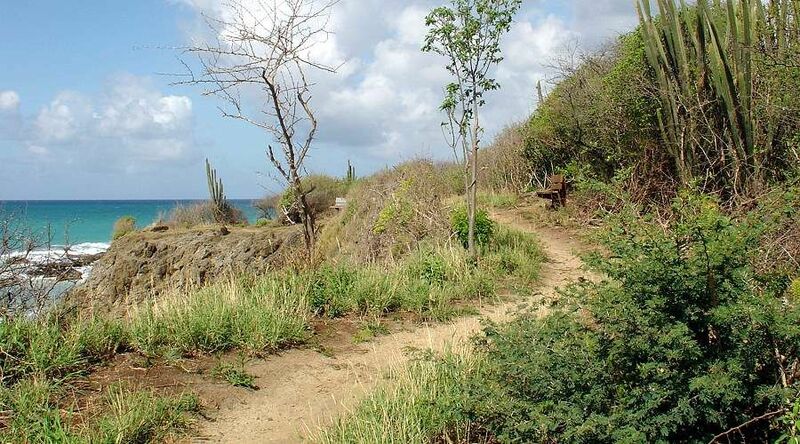 The trail that is more physical departs from Grand Riviere, 8km which will require about 9 hours to climb and descend. Cracks in the lava and craters characterise the part of the trail which takes you to Chinois. Once the Vetta 1929 has been reached you may descend to the floor of the crater. The path can be made difficult by limited visibility and terrain that is slippery when wet. Above all pay attention to not leave the trails as there are many cracks in the lava. 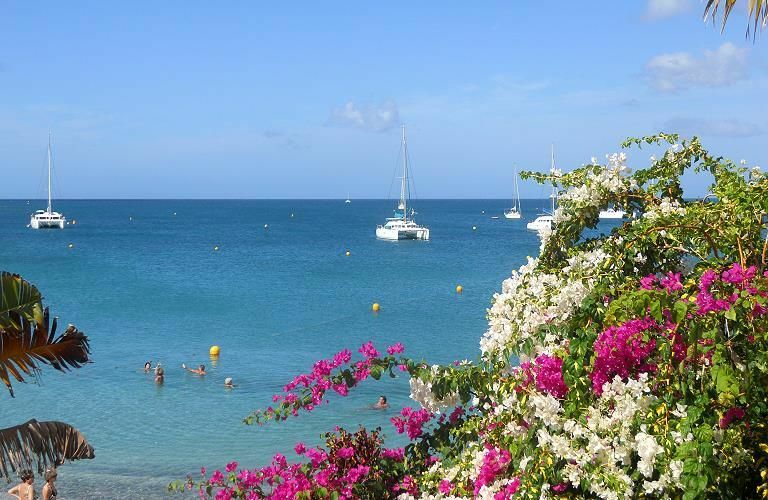 Although we are in the Caribbean be sure to bring with you warm clothing…you’ll be glad you did! An excursion that presents no particular difficulty, following a part of the trace created by the Jesuits in 1600 to reach the more north-eastern part of the island. Take the N3 which leads from Fort de France to Morn Rouge until you reach the D1 which you should follow until you see the sign for the ONF (Office National des Forêts) which marks the trail. 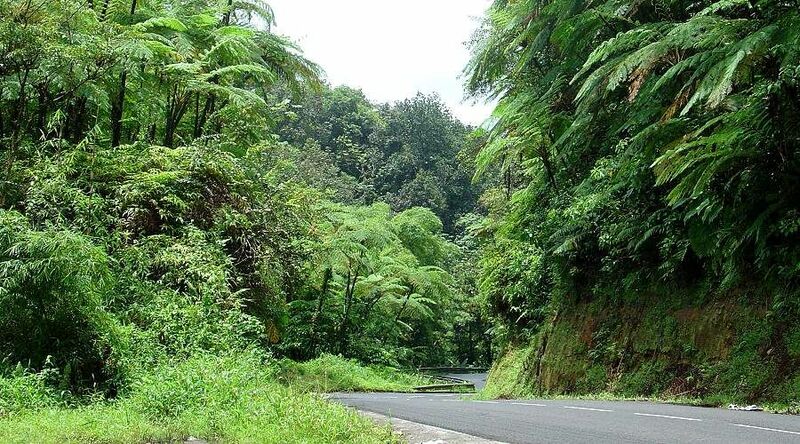 You will be immersed in a tropical forest, discovering unique species of flora and fauna along a 5km trail which should take you no more than 3 hours. Alomg the way you will cross streams populated with z’habitants as the locals refer to the fresh water prawns, and paths strewn with Liana and hanging vine. 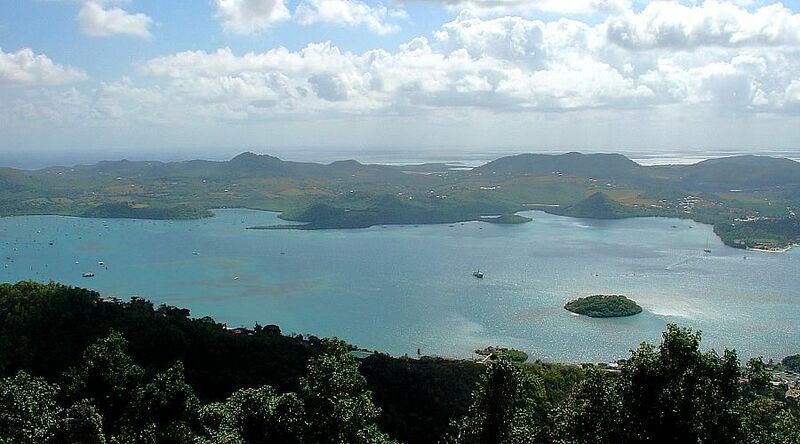 This is perhaps the best opportunity to showcase the flora typical of the northern part of the island. You can return to your car, without having to follow the same route back, by thumbing a ride on the N3. Otherwise you should calculate 6 hours to complete the round-trip. If the rivers are in full flood you must be very careful as the crossings can be dangerous. It may be wiser to back track and attempt the hike on another occasion. Every year people lose their lives by risking river crossings at high levels. Also known as the Slaves Canal, this is an easy yet unique excursion along the old canal which up until 1800 fed the mills for processing sugar. Of the 3.5km length, the first part is the original path along the canal constructed in 1760 from stone, wide a mere 30 cm at times the path is a bit steep! As such those who suffer from a fear of heights have been warned…the views of the valleys below and the coastline however are fantastic. Subsequently crossing a flower plantation rich with porcelain roses, birds of paradise and many other varieties you will reach the entrance to the canal at the river Carbet. This is an excursion which requires that you use the same path both to go and return, taking approximately 3 hours. The point of departure is the Bout-Bois:5km south of St Pierre, along the N2 turn toward the D62 and straight afterward take the road for Bout-Bois for 2km until you reach the sign for the ONF. A 3.5km trail along the coastline, this is a walk suitable for everyone where history and plantations mingle with savannah and the forests. You will also find a strange formation called volcanic bombs. Dive into the past walking along the rail tracks which were used to transport the cane to the mills, pass the former sugar depositaries waiting to be stored in barrels and loaded onto the ships awaiting in the harbour by way of large cables and cogs. 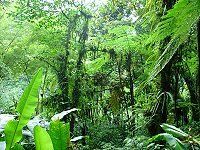 Remnants of this system can still be found peeking from under the vegetation .You will skirt the sea’s edge, banana and sugar plantations along your way. If you do not want to return by the route you came by it is possible to walk to the N1 and catch a collective taxi back to your care otherwise you should count on 3 ½ hours to make the round-trip. 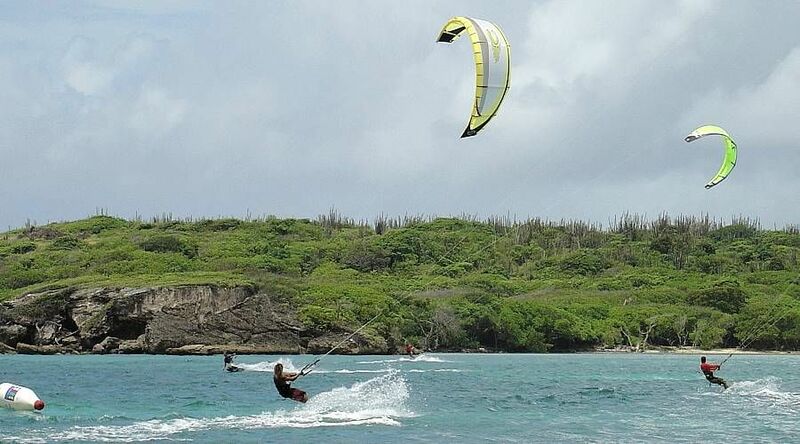 You will find the trail from Le Lorain by crossing the town towards north , taking the left bank of the Riviere Grande Anse , crossing an unpaved road to your right. These spikes of volcanic origin, reach a height of 1196m are a optimum natural observatory . From Piton Dumauze to Piton Lacroix, more than 1000m in gradient! 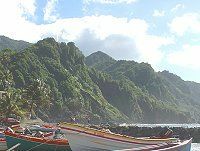 The Trace des Pitons initially follows the Dumuaze river, and as you pass above 700m the vegetation begins to thin out and the views to the bay of Fort de France below as well as Cap Salomon and her hills along the Atlantic coast. Above 900m the path begins to become steeper and more taxing. The braver may continue up the slope to the peak at 1103m and their efforts will be rewarded with a 360° panorama of Marinique.